The Rover 200 Series, and later the Rover 25, are a series of compact cars produced under the British marque Rover from 1994 to 2005. There have been three distinct generations of the Rover 200. The first generation was a four-door saloon car based on the Honda Ballade. The second generation was available in three or five-door hatchback forms, as well a coupé and cabriolet (in relatively small numbers). Its sister model, the Honda Concerto was built on the same production line in Rover’s Longbridge factory. The final generation was developed independently by Rover on the platform of its predecessor, and was available as a three or five-door hatchback. 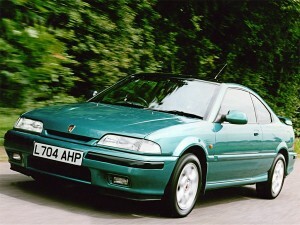 After the sale of Rover in 2000, and following a facelift, the model was renamed and sold as both the Rover 25 and MG ZR. Production ceased in 2005 when MG Rover went into administration. Production rights and tooling for the model, but not the Rover name, now belong to Chinese car manufacturer Nanjing Automotive.